In the wide dining room you will be wecome with our selection of dishes, all home-made based. Radicchio and cured meats as starters, typical Italian Risotto, Lasagne with beef, Gnocchi with Radicchio and cheese sauce, Tagliatelle with duck ragù. 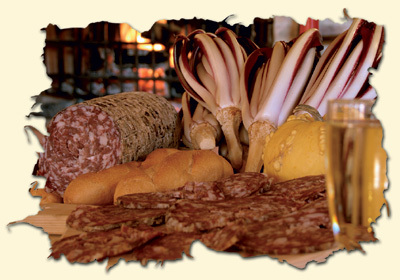 Specialities of the house are the meats of our farm animals. We suggest you to try the chicken or the rubbit stew, the roasted duck and the guinea-fowl with potatoes, grilled vegetables and the Venetian ‘polenta’ (cornmeal mush). To end your typical lunch, taste our home-made desserts. Jam tarts, fluffly vanilla pies, chocolate and coconut cake and zaeti (typical Venice’ s biscuits). Your meal will be combined with excellent local wine and cool spring water.